Kazami Yuuji, a guy with a shady past working for the “company”, in response to his wishes, is sent to live undercover in a closed-off boarding school, Mihama Academy, specially designed for “troubled” teenagers. 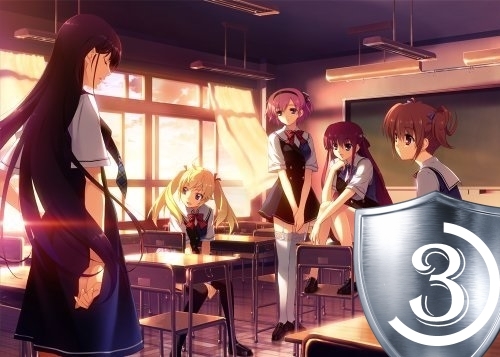 Due to being trained in the art of war from his early youth, Yuuji’s take on common sense greatly differs from that of a normal individual, getting him into many funny situations with the girls attending the aforementioned school: Suo Amane, Matsushima Mitsuru, Irisu Makina, Komine Sachi and Sakaki Yumiko. Written by four different authors, none of who have a work that struck big apart from this one, it is not a surprise that Grisaia no Kajutsu (Monochrome Fruit) exhibits a serious case of schizophrenia, and I don’t mean it in a sense of its mentally troubled characters. There are moments when the prose shifts styles so abruptly it completely takes you out of the experience. Personally, I had a really strange relationship with this work as despite liking the writing of one or two of the writers, I couldn’t stand the others. If someone was to graph my enjoyment of this visual novel it would look like a damn wave function. I don’t know which one, but there is a guy who just can’t help explaining the simplest of concepts with walls of text over and over again. I was literally shouting “I get it. Get on with it, dammit” at my screen constantly. The amount of content Grisaia no Kajutu offers is also colossal; it takes forever to reach the individual routes with comedy skits that don’t factor to the overall story whatsoever going on and on and on until you wanna kill the guy responsible for them. Thank god for the relatively profound, charming characters who somehow manage to make that part of the vn bearable. I still found myself extremely exhausted by all the crap when I finally reached the point where the actual story started though. The quality of the plot of Grisaia no Kajutsu really depends on the route you are reading. Personally, I found Michiru’s story my favorite despite a few ridiculous unscientific concepts as I thought her the most interesting character. I think it’s the first time ever I see a heroine who despite having a very shallow outlook on life is actually rather deep and even comes off as mysterious sometimes. Really enjoyed how she had to deal with her personality issues. Amane’s route has an interesting angle, but is also almost irrelevant to the protagonist himself. He kind of just forcibly enters the story in the end, after most of the stuff is already over, and that’s it. Good set-up but underwhelming conclusion. Yuuji has a lot of chances to shine in Makina’s route, but her being such a ditzy characters it’s really hard to take instances of “romance” or drama with her seriously. She does have an interesting past and complicated family issues which make the route somewhat interesting, but definitely nothing to write home about. Yumiko’s route is based on a concept I had a really hard time swallowing. She is in a fight with her father because she refuses to inherit his company and power… since he is an emotionless prick or something. I mean, couldn’t she just inherit that power and destroy everything he built from inside if she doesn’t like him that much? What’s the point of all this contrived angsty rebellion if your enemy is literally supplying you with the means to defeat him? I bet the idiot who came up with this plotline is also responsible for all the terrible science in this vn. Finally Sacchi’s route is downright ludicrous. What’s up with that FFVIII-like amnesiac “we were actually childhood friends” trite? We spent bashing that concept for over fifteen years; was it all for naught? I liked her as a comic relief character, but she just doesn’t work as a heroine. Just couldn’t take this route seriously, sorry. The meat of this vn is definitely the emotional issues of its characters which are explored surprisingly subtly, though more from emotional rather than intellectual standpoint. I have my reservations about calling anything in this work “intellectual”, but it’s still a good and effective emotional drama. Though, now that I think about it, I can’t remember any tear-jerking dramatic scenes despite the plot almost pleading for some, odd. Maybe they should have gotten Maeda Jun to write something for them too. Incidentally, despite selling its protagonist as an action hero, Grisaia no Kajutsu has very few action scenes, which I thought was quite strange as the narrative seemed to be building on to some huge action outbreak that never came. Anyway, despite a few ridiculous concepts, more stupid in some routes than the others, and the really slow pace, I found Grisaia no Kajutsu a fine read due to its soothing atmosphere, nice characters and the fact it doesn’t shy away from tackling with mental problems in relatively radical ways. It also offers some great production values in terms of very-well drawn character designs and beautiful cello music. Still, I can’t help but feel that this visual has wasted a lot of its potential by not having more dramatic tear-jerking scenes, and not editing out some of its superfluous comedy skits. You might want to use the skip function during the more redundant moments of the common route or otherwise you’ll spend an eternity reading this work. By now Grisaia no Kajutsu has had two sequels released, making it into a trilogy. While I admit I found the fact that the original installment never tackled with protagonist’s past disappointing, it sequel, Grisaia no Meikyuu (Monochrome Labyrinth), is surprisingly boring despite solely concentrating on Yuuji. While it does indeed shed more light on the history of our protagonist, it also has this walls of unnecessary text issue and is just way too bloated with unnecessary details; most of flashbacks about Yuuji’s days in the army constantly venture into the territories of narrative that are completely irrelevant to his future days in Mihama Academy. The third installment, Grisaia no Rakuen (Monochrome Haven), actually tries to continue the story in some pseudo-route where many things from various routes of original Grisaia no Kajutsu happened while others that were less convenient to the writers didn’t. Needless to say, this installment turns out to be quite a surreal experience, as you can never quite tell how everything is supposed to fit in. I was particularly perplexed by the fact that Yuuji somehow managed to date all the heroines at one time or the other without causing any apparent jealousy issues. Anyway, this installment throws away all the pretenses of being a psychological study and jumps into the world of action and (lousy) science fiction, both of which seldom even make sense. Heroines fight terrorists using the skills that were nothing more than gags in the original visual novel; I was half expecting someone to pull out a paper fan as a lethal weapon. Mind you, the whole thing is not a comedy and is played completely straight. Still, to be fair, even though implausible, the strange comedic-relief-turned-serious abilities are treated with strategy and the action scenes are surprisingly captivating, if you can get past the ridiculous premise, that is. Still, the character interactions are as entertaining as ever, and if you don’t expect a particularly good story you can enjoy this for the adequate action scenes and entertaining banter. Nonetheless, the original Grisaia no Kajutsu was already an overwritten and a perfectly self-contained story, and while the prequel to Yuuji’s life was a welcome addition to its universe, this installment is just unnecessary… and really really dumb.